I really wanted to like this one. Even though it's semi-Stockholm syndrome, I've always loved the story of Beauty and the Beast- first the Disney movie, then Robin McKinley's Beauty and a few other retellings. 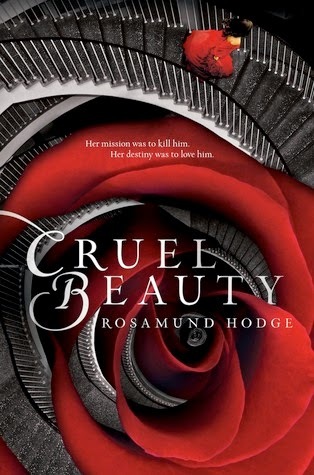 When I read all the 5-star reviews for Cruel Beauty, I got super excited. Unfortunately, I realized a few chapters in my hopes would be dashed. The romance quickly overwhelmed the story, and it wasn't a romance that worked for me. The dark, creepy atmosphere. The "beast's" castle is appropriately twisted and menacing and feels like the prison it is at the start. The idea of mixing Greek myth with fairy tale. I saw a similar idea in another fairy tale retelling (The Princess Curse) but I didn't mind seeing it again here. The love triangle/"romance." Another unhealthy relationship mixed with a bit of physical abuse? I realize Nyx is supposed to be killing her husband, but the majority of her violent outbursts are just that without playing any part in the murder plan. And unhappy marriage or not, how does dallying with another man, especially when you're confused about your feelings for your husband, help anything? Stupidity of the protagonist. Throughout the story, I was both amazed and exasperated by how foolish Nyx could be. She did not strike me as a disciplined soldier who'd trained half her life to assassinate the Gentle Lord. As with many other YA protagonists, she turned into a useless, hormone-crazed teenage girl. It was disappointing. The plot kind of falls by the wayside. Nyx isn't very diligent in her quest to topple the evil lord to begin with. Once a certain revelation reveals her initial plan may not be the best idea, she basically abandons it and decides her purpose in life is to be naught but a lovey-dovey wife. The ending. The time-bending quality reminds me of All Our Yesterdays. Otherwise, it didn't work. (Minor spoilers) It introduces an Astraia I wished I'd met sooner and a more complex, interesting village life. Everything after that feels rushed, convenient and strains credulity. Though I was curious to see where the author would take the story and finished the book quickly, it was a bumpy, exasperating ride. I kept waiting for the promised "Graceling meets Beauty and the Beast," but I got a slightly gothic romance that failed to please. That said, if you love romance with a bit of dark magic, you'll probably enjoy this one. As for future Rosamund Hodge titles, I'll keep an eye on them, but will probably require a "low romance" review from a friend before picking one up. Oooo, I'm so sorry that you didn't love this one, Kel! I personally loved it, but I can see how it's a bit of a letdown in terms of the Graceling meets Beauty and the Beasts comparison. Not very much meets the standards set by Graceling when compared to Graceling, in my opinion. I LOVED Graceling. I can see what you mean about Nyx being stupid at times - sometimes, I wanted to shake her. Overall though, I really enjoyed this book, especially for its fantasy elements. I actually really enjoyed this book! But I was greatly annoyed by the love triangle. Even though it doesn't matter by the end, I didn't enjoy it while it was happening. It was more that Nyx instantly trusts Shade that drove me crazy. You're right that Nyx gets sidetracked, but for some reason she didn't bother me. I also enjoyed the darkness in this and the Greek inclusion. Sorry this didn't work better for you :(.